The stunning National Building Museum! Back in February, a friend of mine and her kids along with my kids and me went down to the National Building Museum in D.C. for a homeschool field trip. I had never heard of this museum, but they had some cool-sounding homeschool workshops which is why we went. Boy, what a treat! The museum is housed in this old, incredibly spacious building that is the perfect fit for what this museum is about - a museum about building in America. The building itself is worth going to see, but some of the exhibits were definitely highlights too - like "Designing for Disaster" and "The Architectural Image, 1920 - 1950". They were both very interesting! The kids had fun in their different workshops and I thought I'd share some of the things that stood out to me in one of their exhibits - "Designing for Disaster". As you might already know, I'm always on the look-out for interesting ways of executing museum exhibits and the use of technology in museums. This exhibit had my interest piqued from the start for a few reasons - I love learning about earth science and natural disasters, their use of space was well thought out, and they had sweet educational technology. The treatment of the walls for the earthquake portion of the exhibit was clever and interesting to look at. It had a great impact for the subject matter. For the tornado section, their use of the tall ceilings was fantastic! They wired things to the ceiling like a bicycle wheel, a garbage can, scraps of metal, and a stop sign among other things. It gave a great sense that you were caught, frozen in time, in some high winds. Very cool idea! The room is a life-sized tornado-safe room with a cut away which is also a great idea. The most popular part of the exhibit was the technology that I felt was one of the best I've ever seen. This table is a mini wind-turbine testing station. The kids put together the heavy wooden houses with separate roofs. They arrange the houses at whatever angle they think is best, set the wind speed, and then push a button. The wind turbines speed up, a wind speed gauge tells the person how fast the wind is blowing and then you can see if the houses can withstand the wind at the angles they were set at. It was so fantastic! The kids were so serious about it, collaborating, arguing, and debating about which was the best way to set up the houses for the different wind speeds. The technology was so simple, very durable, and the kids were able to work as a team to figure things out. Hands down the best technology at a museum I've seen ever! You can see that safety was definitely taken into consideration as well with the net at the end and the metal grate where the air intake is. The only thing underneath was a plug. There was a plaque with an explanation of what you were to do along with a diagram of the wind scale used to measure tornadoes. Only buttons were used to get things going. Even though I didn't read many signs, I still felt I was able to get a lot out of the exhibit. Lastly, I saw on the 2nd story this neat little display of different old bricks from various local brick makers. I like how they highlighted the maker's marks with white paint. All the designs were so interesting! We've found a few bricks like these around our property. It's cool to know there are so many different kinds. 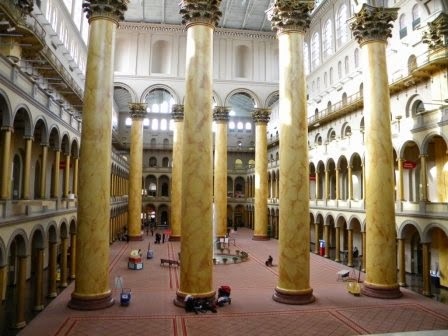 If you're ever in Washington D.C., you might want to consider visiting the National Building Museum. It's not part of the Smithsonian, so there is an entrance fee, but I think it's worth it. There are a lot of great things at the museum I didn't even touch on, so check out the website!